Have you ever been to a scratch patch? Here in the United States they're virtually unheard of. In fact, I'd never seen one until Earth's Minerals Scratch Patch opened in a nearby neighborhood. 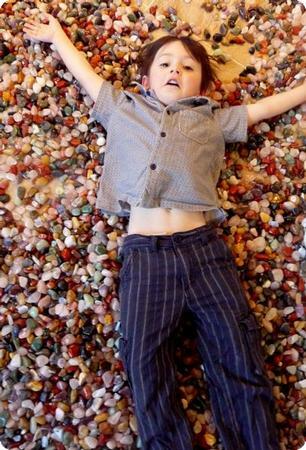 The floor is covered in polished rocks, making it a dream come true for kids who are young enough to have rock collections (and old enough to know rocks don't belong in your mouth no matter how pretty they are). Kids can spend as much time as they want investigating, searching for favorite stones, and using an identification chart to find out the name of each gemstone. Before they leave, each child gets to fill a small bag with their favorite finds. According to the owners, scratch patches are common in South Africa. Has anyone ever seen one anywhere else? What other fun kids activities do have you seen in other countries that are difficult to find in the US? Carolina on June 4, 2009 at 5:04 p.m.
Debbie on June 4, 2009 at 5:18 p.m. Yes, they did have nice benches! I went with a friend and we had a nice long chat while all our kids explored the gemstones. amida on June 4, 2009 at 6:59 p.m.
That looks super fun! I have never heard of one but I'd love to visit it! My 2 year old would love it. She is a hoarder of rocks. jackie on June 4, 2009 at 10:21 p.m. I have a hoarder too. My little guy would be in his heaven here. I've never heard of a scratch patch before. We spent a couple of months in South Africa and never saw such a thing but then again, that was pre-baby so we probably just weren't looking for it. I'm adding this to a long list of reasons to get back down to Seattle. Thanks! I also want to say how much I enjoy the shot of your little one ... gotta love the passion! Victoria Wallop on June 5, 2009 at 12:42 a.m. I've never heard of this in Europe, my kids would LOVE it! Tim Marks on June 5, 2009 at 5:01 a.m.
Neat idea. Rocks seem to get collected in this family by a certain adult member :) They make very nice decorations. Mara Gorman on June 5, 2009 at 5:03 a.m. This is about the coolest thing I've ever seen - my kids would think they'd died and gone to heaven. Marina K. Villatoro on June 5, 2009 at 8:34 a.m.
My son would love it, but so would I!!!!! jessiev on June 5, 2009 at 9:54 a.m.
WAY cool! i would have a blast there. thanks for sharing! simone on June 6, 2009 at 8:53 a.m.
this has got to be the most amazing thing ever! a) fostering play, creativity, and exploration with natural objects, b) my son would be so overcome with disbelief that fantasies really do come true. i think he would just stare with his mouth agape until it sunk in that it was real, and c) i'd totally want to join him!! Dominique on June 6, 2009 at 9:26 a.m. Yes, Tim could tell stories about the rock stores and piles I've dragged him to over the years...and the full jars of rocks all over the house. The whole scratch patch thing reminds me of the amethyst mine we visited in Thunder Bay, ON years ago. Even as we were out on the mountain and a thunderstorm was rolling in...Tim had a difficult time dragging me away from the slag pile with my little pail full of amethysts! It's probably a good thing there were no scratch patches around here when I was growing up! Tina on September 25, 2009 at 1:32 p.m.
My kids love. I love it. You have to visit them!! Krista on April 27, 2011 at 3:25 p.m. Unfortunately, this place closed in Dec. 2010.